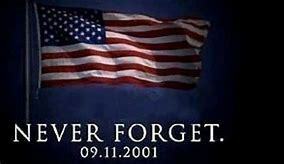 Today is September 11, Patriot Day and National Day of Service and Remembrance, established as a day to remember the 3,000 people who lost their lives during the 2001 terrorist attacks in the United States. On the morning of September 11, 2001, four planes were hijacked, three of which were deliberately flown into the Pentagon in Washington DC and the Twin Towers of the World Trade Center in New York City. The fourth plane crashed into a field near Shanksville, Pennsylvania. These horrific acts of terrorism are by far the most destructive ever in loss of life and damage on U.S. soil. Each year, in remembrance of the victims, special memorial services are held at each of the three sites, and the American flag is flown at half-staff at individual American homes, the White House and at all United States government buildings and establishments at home and abroad. Americans observe a moment of silence beginning at 8:46 am (Eastern Daylight time) the exact moment when the first plane struck the North Tower of the World Trade Center. National Day of Service and Remembrance was added on to Patriot Day by President Barack Obama in 2012 to encourage all Americans to honor the victims by volunteering in service opportunities as a reminder of the ways that they live on in the people they loved, in the lives they touched and the courageous acts they inspired.